Villa Emo, located in the village of Fanzolo di Vedelago, was built in the period 1559-65. The central residential space features four columns (two of them engaged) in the manner of a Greek temple front. As at nearby Villa Barbaro, barchesse (farm buildings) extend symmetrically from the left and right of the central structure, with the ends of the barchesse surmounted by dovecotes. The result is the famous 5-part profile familiar in later Palladio-inspired architecture, including the U. S. Capitol building (with the Houses of Congress replacing the dovecotes!). 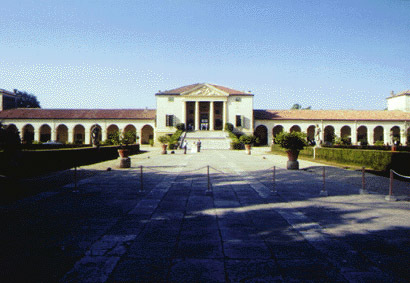 Villa Emo was, until its sale in 2004, the only Palladian villa that had descended in male lines of the original family continuously since its construction. The Emo family, which came to Venice from Greece before the year 1000, produced civic and military leaders throughout the long history of the Venetian Republic. Location: Fanzolo di Vedelago (Treviso District). Accessible by car from Venice (45km). Monday, Wednesday-Friday 2:30-6:00 p. m.
Sunday: 10:00 a. m.-12:30 p. m., 2:30-7:00 p. m.